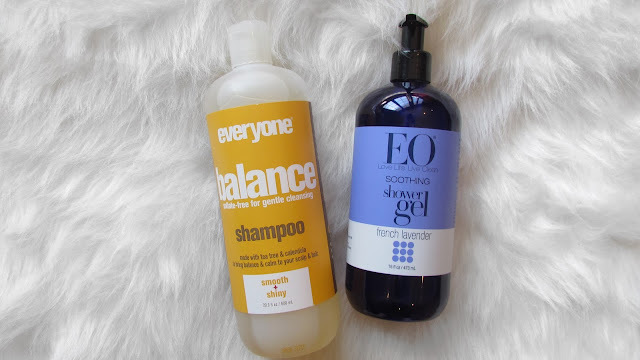 EO products sent me one of their Everyone Hair Balance Sulfate Free Botanical Shampoo and their EO French Lavender Botanical Shower Gel to review! So lets get on into my review! What they say: Susan and Brad wanted to work the way they lived; inspired, healthy, in touch with nature, and generous. They had a simple vision: they wanted to live like they were retired. For them, that meant spending time with family and friends, not worrying about money, and making sure they were leaving the planet in a way that honored their children and grandchildren. Brad and Susan didn’t think there had to be a separation between work, home, and personal life. They believed in one life: one that valued transparency and trust. Susan and Brad decided to name their company EO for the essential oils that were both their first products and the heart and soul of everything they would create. They chose the motto: Love Life, Live Clean. They felt this simple statement explained the purpose of their vision. In 2012, we took our ten years’ experience and launched a line of products designed for young people and large families that had little or no choice for quality, botanical body products. With a 32oz. bottle of soap priced at $10, these products were priced for every budget Everyone for every body was born. I was so excited to try these out that I actually had to take them out of my bathroom and dry them off to take pictures for this review. The shampoo is actually now part of my everyday hair washing routine and the shower gel is also AMAZING but my mom stole it from me since she loves lavender! I actually adore both of these products and I will absolutely be buying more products from the EO brand! The shampoo smells so fresh and light that I didn’t have to worry about the scent giving me a headache or anything and the only other thing I would say about that is that to really get a good lather I used a little more then the recommended amount! It ended up being perfectly fine but wanted to give you guys a heads up! This shampoo is also sulfate free, which is always recommended to me by my hair stylist so that’s a major plus in my book! For the shower gel I’m usually not someone who is obsessed with lavender but I’m obsessed with this shower gel! It smells AMAZING; works like a charm and it’s non-drying like some other shower gels I’ve used. You can really tell that it’s moisturizing you while of course cleaning! Plus to add to all of that, ITS CRUELTY FREE and of course the shampoo is also! A+ for EO products! If you are in the new market or even if you aren’t take a peek at the EO website to see where its sold near you! For me I have it locally at Bed Bath & Beyond and Whole Foods! The whole range is fairly priced and absolutely worth it! I highly recommend you check the products out!